Entering a holding pattern on a project can give you the opportunity to gather additional information about a problem. But, sometimes, holding consumes valuable resources with disastrous consequences. The mobile market dynamics are extreme, unpredictable, and fragmented. There are numerous operating systems and a multitude of platform versions, networks, hardware, and form factors making it a challenge to maintain mobile application quality. Find out how to adjust to the shift from traditional to mobile development—which additional elements are a must and which ones can be maintained. In the first installment of this article, Dr. James Whittaker discussed turning testing on its head—to revitalize and improve the value of late-stage testing. James also discussed ideas behind empowering your dogfooders, testers, and the crowd to significantly and efficiently improve software quality. In part two, Jason Arbon discusses the research and engineering experimentation behind realizing these ideas into new tools and processes. 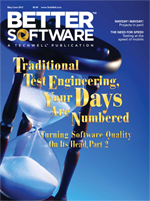 A letter from the Better Software magazine editor. FAQ: Do I Need to Program to be a Tester on an Agile Team? In this installment of FAQ, SQE Trainer Janet Gregory answers one of the questions students ask her most often. Introducing a reverse mentoring program provides employees and managers benefits beyond simply learning a new technology or skill. What makes a team agile? Is it in the way it plans projects or how it engineers its products? In this article, Steve Berczuk explains how agile code and technical practices can help a team stay agile across the product lifecycle.